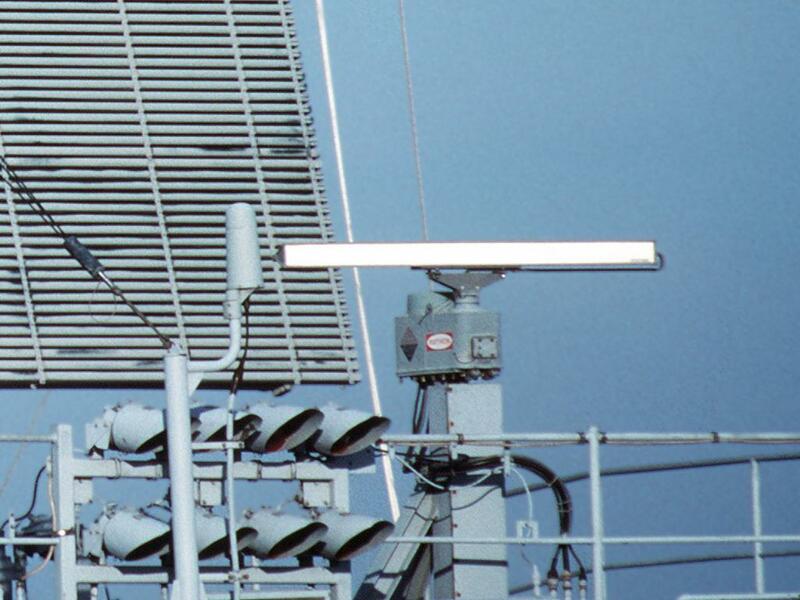 The AN/SPS-64 Mariners Pathfinder radar is a versatile surface search and navigation radar with raster scan bright display indicators, and offers enhanced operational characteristics. The AN/SPS-64(V) is supplied in X-Band (9,375-9,420 MHz) or S-Band (3,030 MHz) versions with a choice of relative, true motion and collision avoidance displays. Plan Position Indicator displays of 30 cm and 41 cm are the basic configuration with expansion options and accessories available for the majority of requirements. The RAYCAS V indicator combines the presentation of radar information with collision avoidance, target tracking, navigation and tactical data on a 41 cm display. The RAYPATH indicator combines radar information, collision avoidance and navigation data on either a 30 cm or a 41 cm bright display. These commercial, large ship radar systems have demonstrated high reliability and performance, while offering a most cost-effective radar system for all types of naval vessels. By offering a totally compatible choice of antennas; 25, 50 and 60 kW transmitters; and display indicators, over 15 different radar configurations are available. The fully modular design allows duplication of systems when required, and intermixing of displays and transceivers in any combination. With an adaptive interface capability the suite of displays can be used with other radar systems. Interfaces for the AN/SPA-25 and AN/SPA-66 are available, as well as interfaces for fire control, and electronic support measures systems. The variants are combinations of the basic radar with different antennas, displays and interface units tailored to the needs of the ships carrying them. SPS-64(V)1 Coast Guard system with the six-foot X-Band antenna, a 20 kW transmitter and a single 12-inch display. Civil equivalent, RM 1220 6X. SPS-64(V)2 Coast Guard system with the six-foot X-Band antenna, two 20 kW transmitters, one 12-inch and one 16-inch display. Civil equivalent, RM 1220 6X. SPS-64(V)3 Coast Guard system with two six-foot X-Band antennas and two 20 kW transmitters, two 12-inch and one 16-inch display. Civil equivalent, RM 1220 6X or RM 1220 6X RM16. SPS-64(V)4 Coast Guard system with one six-foot X-Band antenna, one 12-foot S-Band antenna, one 20 kW X-Band, one 60 kW s-Band transmitter, one 12-inch and two 16-inch displays. Civil equivalent, RM 1220 6X or RM1660 12S RM16. 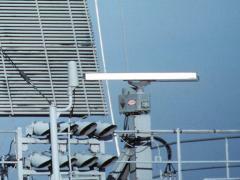 SPS-64(V)5 Army system using one six-foot X-Band antenna and 20 kW transmitter, with one 16-inch display. Civil equivalent, TM 1620 6X. SPS-64(V)6 Coast Guard system with one six-foot X-Band antenna, one 12-foot S-band antenna, one 50 kW X-Band and one 60 kW S-Band transmitter, with one 12-inch and one 16-inch display. Civil equivalent, RM 1250 6X or RAYCAS 1660 12S. SPS-64(V)7 Coast Guard system with one six-foot X-Band antenna, a 20 kW X-Band transmitter and one 12- inch display. Civil equivalent, RM 1025 6X. SPS-64(V)8 Coast Guard system with one six-foot X-Band antenna, a 20 kW X-Band transmitter and one 16-inch display. Civil equivalent, RM 1025 6X. SPS-64(V)9 Navy system with one six-foot X-Band antenna and a 20 kW transmitter, with one 12-inch display. Civil equivalent, RM 1220 6X. SPS-64(V)10 Coast Guard system with two six-foot X-Band antennas, two 20 kW X-Band transmitters, one 12- inch and one 16-inch display. No civil equivalent listed. SPS-64(V)11 Coast Guard system with one six-foot X-Band antenna, one 20 kW X-Band transmitter and one 12- inch display. Civil equivalent, RAYPATH 1225 6X. SPS-64(V)12 Army system with a 10 kW X-Band transmitter and one 12-inch display. Civil equivalent, 1210 4X. SPS-64(V)13 Army system with a 10 kW X-Band transmitter and one 10-inch display. Civil equivalent, 1010 E 4X.